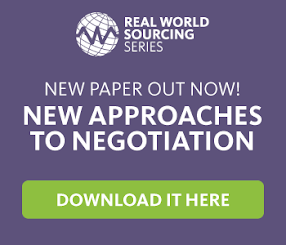 Strategic Sourcing: Is Your Sourcing Organisation Best-in-Class? No wonder then that, according to a recent report from Ardent Partners, identifying more savings opportunities ranks as a top business pressure for 65% of CPOs. In The State of Strategic Sourcing 2013: Speed is Good, Agility is Better, analyst Andrew Bartolini looks closely at what forward-thinking CPOs are doing with supply management strategies to push to the next horizon of savings with strategic sourcing. There’s more of course. Leaders are savvy about linking key sourcing systems to improve visibility and accelerate process efficiency. E-sourcing, when used in concert which contract management systems ensures that savings identified at signing are captured. And when linked with spend analysis systems, e-sourcing reduces the time required to establish criteria for contracts and ensures that bidders have all the information they need to present the best possible offer. If you’re feeling the pressure to up your cost-savings game, check out the report The State of Strategic Sourcing 2013 to benchmark your organization against peers and leaders before your next meeting with the finance team. You might affirm that, based on what you are doing today, your own sourcing organization is among the best-in-class. If not, you can quickly see what gaps you need to address and what you can do now to move from good to great. Hi i am Mr Omid, this is really an awesome presentation. I appreciate the way you explain things, this is pragmatic and concise.